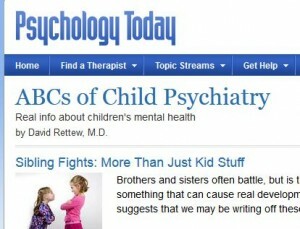 The editors of Psychology Today (PT) have asked me to be one of their official bloggers! In accepting the job, I got the okay to repost many of the content that you see on this blog, modified somewhat to target more of a general audience rather than primary care clinicians and mental health professionals. I urge you to check out the new blog ABCs of Child Psychiatry as well as many other excellent blog that can be found at the Psychology Today website. If you are enjoying looking at this blog, there is nothing you need to do, as the vast majority of posts on Psychology Today will appear on this UVM blog as well. There may be some exceptions in the PT blogs related to my upcoming book.